“What we’re hearing from mayors and other civic leaders across the country is a rapidly growing realization that city services must meet today’s always-mobile residents wherever they are." Mobile government technology leader PayIt was awarded third place from among an original pool of 62 startups nationwide at the inaugural U.S. Conference of Mayors and Code for America Tech Innovation Pitch, sponsored by Amazon Web Services. PayIt finished third of 11 startup companies that made the final cut to pitch the distinguished panel of mayors and industry experts at the recent South by Southwest (SXSW) 2016 interactive conference. The panel cited the practical-ness of PayIt’s mobile technology solutions and its ability to address and simplify such a wide variety of government services and citizen use cases. 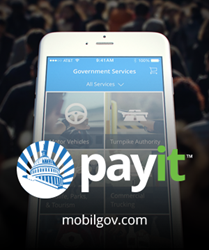 To learn more about PayIt and the #govtech movement, visit http://www.mobilgov.com. PayIt’s cloud-based mobile government and payment platform technology provides state and local agencies and their citizens with a personalized mobile and web app experience for simplifying transactions and automating citizen engagement—with zero upfront cost. For additional information, contact Katie Beth DeSchepper at katiebeth(at)mobilgov.com.